I originally moved from Northern Ireland to the UK, after having major life saving surgery, to start my life again at uni. The culture is not so open here in the North east of England compared to NI. One thing though is I don't know how to really chat guys up anymore since my lack of confidence from surgery 6 years ago. I'm now 26 and when I meet a guy for no strings fun, they just get up and walk away when they see the scars and the bag that's attached to me. Now this has not stopped me trying to chat people up, but I can't seem to talk to anyone in a bar. I've had a few moments when a straight guy has talked down at me when they found out I was gay and then walked away. I would like to find that person in my life, but I'm wondering how I should go about chatting up guys, and should I tell them about my surgery when they know me a lot better? I can't help wondering whether you can find ways to build confidence in other areas of your life? If there's anything that you're good at, or can be successful at, then building confidence in whatever it is should eventually have a positive effect on your confidence when dating. I've been thinking about this guy's situation a bit more now, and I think he's right, there's no need to tell people about his surgery straight away. To my mind, there's an approximate parallel here with one of the main characters in the recent Kingsman film. 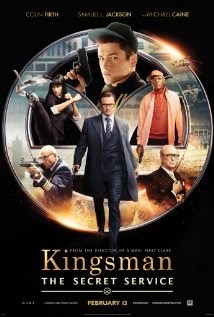 The Kingsman film film is about a fictional independent British spy organisation (called Kingsman). The spies are mostly from upper class (i.e. rich) backgrounds, and there's a young recruit with the nickname Eggsy who's from a very working class background. Eggsy tries to get along with the other recruits, who're also all quite upper class, but most of them look down on him because of his background. It all comes to a head in a scene where six recruits, including Eggsy, do a parachute jump as part of their training. They're falling through the air, about half-way through the skydive, when their training instructor tells them that he didn't give one of them a parachute, and that they need to work together to solve the problem! Eggsy formulates a plan, namely that they need to pair up and hold each other tightly so that if the parachute of one of the pair fails, the parachute of the other will save them. However as they get closer to the ground, four of the recruits can't handle the idea that they might not have a parachute and one by one they pull their ripcords. All four parachutes work, leaving Eggsy and the other (female) recruit still falling. Luckily they manage to implement Eggsy's plan, with the other recruit pulling her ripcord and finding that the parachute does work, so both land safely together. On the ground, Eggsy then says to the instructor in a bitter voice "So I'm the expendable one then :-(", because the parachutes had all worked for the upper class recruits. The instructor then pulls Eggsy's ripcord and the parachute does open, so in fact all six recruits had had working parachutes after all. "You need to lose that chip on your shoulder!" says the instructor. The parallel with the reader's situation is that he seems to have a chip on his shoulder in connection with his surgery. The surgery was obviously a major event in his life, so it's quite understandable that it's had such a big effect on him. The way he feels now is probably the result of a few bad experiences, where guys that he met genuinely did look down on him. The result is that he now he's now worried that everyone will be like that, which undermines his confidence. I'm always saying that confidence is the most important attribute when dating, so as I said in my email to him, finding ways to build confidence in other areas of his life will help. After all the training he had, the character Eggsy in the film would never deny or try to hide his background, but neither would he think about it very much. It's just part of who he is. The same should be true for this reader. The surgery is just a part of what's happened to him, and there's no reason to mention it early in any friendship, because that gives it an importance that it doesn't deserve. In fact, this is another case of The Confidence Mirror. If a person feels uncomfortable about something when talking to someone else, then that discomfort is often reflected back to the person. Similarly, if a person feels good about something, then that often gets reflected as well. I usually talk about this in connection with a conversation where the person comes out as gay to the other person, because in that situation it's important that the person who comes out feels good about themselves. For the reader, this applies to the life-saving surgery that he had (as well as to being gay). The scars etc that he's been left with are the proof that he's a survivor, so perhaps if the thinks about them like that then he can feel a bit better about what's happened to him. In the film, Eggsy lost the chip on his shoulder, and then with the right attitude goes to save the world from the evil billionaire villain. I see no reason why the reader can't do the equivalent thing, and find himself the boyfriend that I'm sure he deserves :-). Does anyone else have any ideas for this reader?